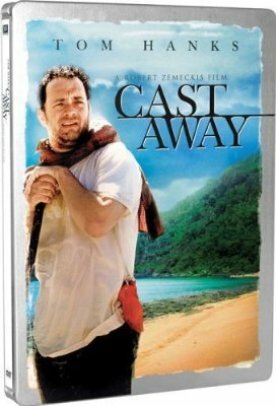 There are just enough good things about Cast Away by Robert Zemeckis (Forrest Gump, Contact, What Lies Beneath) to make it worth seeing. These are as follows: (1) what is perhaps the most thrilling and frightening representation of a plane crash on film; (2) magnificent photography of the South Seas and the island where Tom Hanks, the sole survivor of the crash, is cast up; (3) the performance of Hanks himself, who is rarely less than a compelling screen presence; and (4) the portrayal of an affecting reunion between the four-year’s absent castaway and the girl he left behind him (Helen Hunt) who, persuaded by friends that he was dead in spite of her own intuition, has married someone else. This is a real weepie in the grand old Hollywood tradition, so rush right out and see it. But, fair warning, the picture is also a bit of a mess, as you can hardly help noticing. It is really three movies in one. First, it sets out to be a morality play, again of an old-fashioned Hollywood sort, about a time-obsessed workaholic whose enforced removal from the daily grind teaches him something of the truly important things in life. Second, it is a Robinson Crusoe tale, the story of a single man reinventing the world for himself on a desert island with only a few precious relics of the civilization from which he is forcibly exiled. Third, it is a love story of what has lately been a rare sort in Hollywood: one, that is, in which restraint is more romantic than indulgence. Any one of these could have made a terrific movie, and all three show flashes of brilliance in this one, but they keep getting in each other’s way. The first, for instance, offers an amusing vignette of Mr Hanks in his pre-castaway life as a Fed Ex manager trying to impress on skeptical Russians the American discipline of time. “We live or we die by the clock,” he says, and “let's not commit the sin of turning our back on time.” To a comparatively laid-back fellow employee he explains: “If we’re two minutes late, the next time it will four minutes late, then eight minutes late. And the next thing you know, we're the U.S. Mail.” The whole direction in which the movie is going makes this a point of view that cannot survive his island experience unqualified, yet Zemeckis never gets around to qualifying it. The time nut remains essentially unrebuked and is quite forgotten by the end, Perhaps he thought that the extensive co-operation of the FedEx Corporation was worth letting the matter quietly drop. The Crusoe stuff occupies the central portion of the film and is all marvelous so far as it goes. The castaway’s first halting steps towards learning essential survival skills—building shelter, splitting coconuts, catching fish, lighting a fire—make for cinematic fascination of the first order. But just as he is beginning to get the hang of things a screen card pops up saying “Four years later,” and we cut to the exotically bearded and costumed Mr Hanks as a master of survivor skills. Hey! There must have been a few quite interesting things that happened during those four years, not the least of which, we swiftly learn, is that our hero has become best friends with a volleyball. But rather like the time-obsessed Fed Ex man he showed us in the first of his three-movies-in-one, Mr. Zemeckis has to get on to the next thing. Mustn’t dawdle. Characteristically, this emotional moment is pushed too far, as he goes on to point a rather leaden moral— “Who knows what the tide may bring?” But it still retains its power to move us. It’s just that it might move us more if it were not part of a too-brief coda to the other two movies it is competing with. In addition to this competition there is a framing device which uses the fortunes of a FedEx parcel, from the parcel’s point of view, to set up the time-theme and ultimately to suggest a happy ending, minus the last few frames, which is presumably the best you can do with happy endings when you think that supplying them in the usual way would look too corny. Maybe Zemeckis should have had more the courage of his convictions and gone for corniness all the way. At some level he seems to understand that that’s what Hollywood does best.